I invented this bit of magic late last week as I was preparing for the annual Pie Party hosted by Jackie Gordon and Ken from Hungry Rabbit. Pie Party is an amazing potluck event in New York City that brings together a group of food bloggers and other food professionals to sip cocktails and feast on dozens and dozens of homemade sweet and savory pies. This year was my first time attending, and since I have little interest in flaky crusts (I'm weird; I know), I somehow got it into my head that I was going to make a Puerto Rican-inspired savory pie featuring a plantain crust. It sounded genius in my head (all things sound genius in my head), but for some reason I decided that I would just leave the details until the last minute. 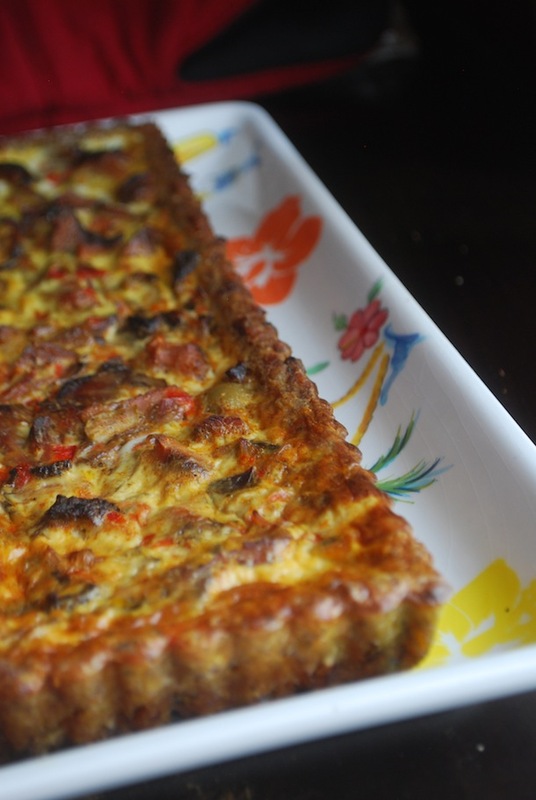 I showed up at the grocery store the morning of, with vague ideas involving pork and a rectangular tart pan, and a nagging sense that perhaps I should have put in a bit more thought. I eventually decided to go with mofongo, which molds easily and crisps nicely, making for an incredibly flavorful base. I also threw some pork into the dutch oven to simmer, but I admit that it wasn't until the crust came out of the oven that I finally figured out how I was going to fill it. I'm pretty sure I even stood staring at it for a bit saying to myself "What am I going to put inside you?" as the clock ticked and the time for me to hit the shower drew near. I decided on a classic custard base filled with chopped green olives, roasted red peppers, and chunks of the aforementioned slow-braised pork in a Puerto Rican style marinade of sour orange juice, garlic, and cumin. I pulled it out of the oven, letting it cool as I rushed into the shower and got dressed. I finally got to the event (just 30 minutes late! ), a bit nervous to serve something I hadn't even tasted--and even more so when I saw that it had already attracted a bit of attention from other attendees eager to try the "mofongo tart." When the eating began, I watched one guy actually climb over a couch in a bid to get to it first. "Oh God...it had better be good," I thought. Fortunately, it was. Eugene and I got a little sliver to share, and were excited to find that not only was it good, but it was actually kind of amazing! Eugene declared it by far his favorite of the savory tarts (although he has to say that so take it with a grain of salt). The crust was crispy and garlicky with little bits of smokey bacon that gave into a creamy filling with chunks of savory pork, salty olives, and sweet red peppers. I immediately knew that I was going to make it again so that I could share it with all of you. You start off with a batch of mofongo, a Puerto Rican side dish made from fried green plantains that are tossed with a garlic dressing and then mashed along with bacon or pork rinds (recipe below). This is typically served molded on the side and topped with stewed shrimp or meat, but in this case the mofongo is pressed into a tart mold to create a nice thick crust. You can then pop the tart in a 400 degree oven for about 15 minutes, crisping the plantains until they are golden and crunchy around the edges. While the crust bakes, you can prepare the filling--a typical custard base, much as you would use for a quiche--by combining a couple eggs and some heavy cream seasoned with cumin, paprika, salt, pepper, and a dash of cayenne. To this you add about 2 cups of the prepared pork, along with coarsely chopped green olives and roasted red pepper. I LOVE the briny saltiness that the olives add to the final dish; you might be tempted to skip them, but I urge you to give them a try; they really work to balance out what could otherwise be a pretty heavy and rich dish. The pork shoulder itself is pretty key. It's braised using the same ingredients used to make a traditional Puerto Rican pernil--sour orange juice, garlic, cumin, paprika, salt, pepper, and cilantro. I suggest making the pork in advance as it will keep well and can be made as far as 3 days ahead. As the pork cooks, the sour orange juice will break it down and the house will fill up with the most incredible aromas. I know for many people, the holidays smell like cinnamon and baked apples, but to me it smells like slowly cooking garlic and pork. Place the crisped and slightly cooled base onto a baking sheet, and pour in the filling right to the top. It'll puff up while cooking, but once cooled will settle back down into the tart making for a perfect fit. After the tart bakes, remove from the oven and let cool in the base so that it has a chance to settle into the shape. Unmold it just before serving, sliding it out onto a platter and cutting into slices. Note that the tart is delicious while hot, but I actually prefer it room temperature, making it an ideal dish for entertaining or even for a brunch at home! I am definitely going to be making this again once the holidays get here, and hope that you will, too! P. S. Want more Puerto Rican recipes? Check out my eCookbook: The Puerto Rican Christmas Table with 40+ recipes and full-color photos. Click here to learn more! 6 strips bacon, cut into small pieces. Prepare the tart: Once the pork is ready, use a fork to pick out about 2 cups of the tender pork, either shredding or chopping it into small pieces. (The rest of the pork can be eaten on its own or in sandwiches or tacos.). Whisk together the ingredients for the filling and add the pork. Set aside. Preheat oven to 400 degrees. Press the mofongo into your tart pan to form a 1/2" thick crust--use either a 9" round or a rectangular pan, you can also use multiple smaller ones for individual portions. The mofongo should be warm and wet in order to best fit into the pan so reheat if necessary, and moisten with olive oil in order to help it stick together (you should be able to squeeze it into a ball and have it hold). The oil will also help it crisp in the oven. See photo above for clarification, if necessary. Place the crust on a baking sheet and in the oven for 15 minutes until the mofongo is golden and crisp. Remove and let cool slightly before pouring in the filling right to the top of the crust. Return to the oven and bake for 25 to 30 minutes, or until just set. Let cool completely in pan before unmolding. Serve room temperature. SUBSTITUTION IDEAS: Instead of the braised pork, you can easily use diced chorizo, shrimp, cooked ham, pulled brisket, pot roast, or even just vegetables and cheese. Have fun with it and get creative!